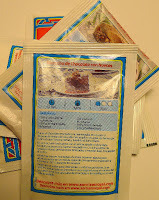 A couple weeks ago when I was making that gorgeous quince and olive oil cake (recipe from Virgin Territory by Nancy Harmon Jenkins is here), I noticed that the packets of baking powder all had recipes on them. A couple of those recipes looked interesting. 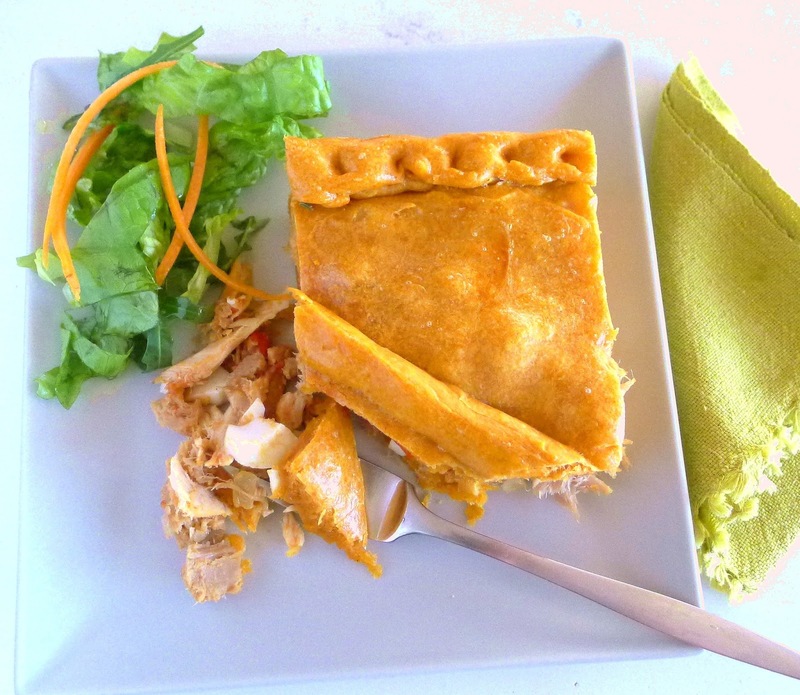 Empanada with tuna filling, a recipe from the baking powder packet. 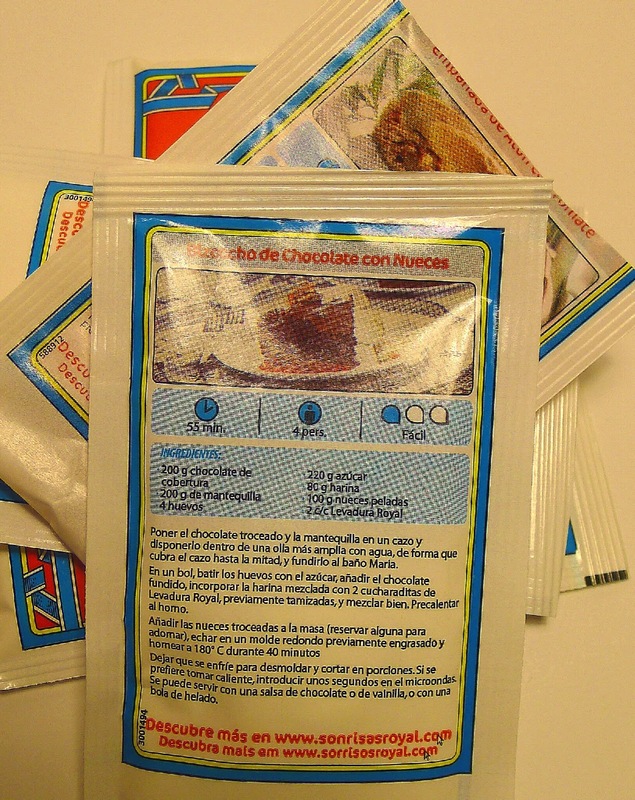 Baking powder, in Spanish, is levadura artificial. 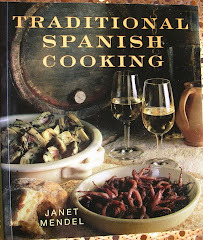 It’s not widely used in traditional recipes—perhaps because it was not very available. When I first came across it in recipe researching, it was called “polvo Royal,” for the brand name, or “levadura Royal,” to distinguish it from levadura, bakers’ yeast. 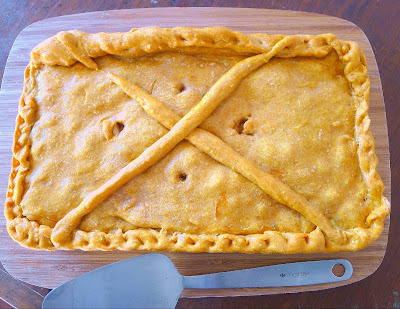 I tried out the Royal baking powder recipe for an empanada with a tuna filling. The dough is quick to prepare—no rising time needed, as with classic yeast-risen empanadas. Besides converting the metrics to American measures (450 grams of flour = 4 cups + 2 tablespoons of flour), I couldn’t resist making a few additions to the printed recipe—some sliced olives in the tuna filling and a spoonful of Sherry vinegar to pick up the flavor. The recipe didn’t specify how thick to roll out the dough nor what size molde, mold or pan, to use. I opted for a rectangular pan, but an extra-large round pie pan would also work. The recipe called for "aceite," oil. 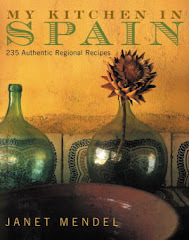 Being a Spanish recipe, that's just got to be extra virgin olive oil. It makes a soft dough, easy to roll out. The crust is moist, not flaky. 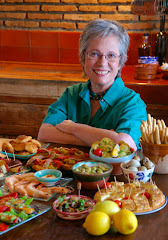 The spoonful of pimentón (paprika) adds flavor and gives the crust a great color. I'll use this dough recipe again, maybe for a chicken pie. Apologies for the weird measurements! Conversions are rarely exact. Rather than round-off, I used American measures as close as possible to the metrics of the printed recipe. Thus: 1/3 cup + 1 Tablespoon of olive oil. 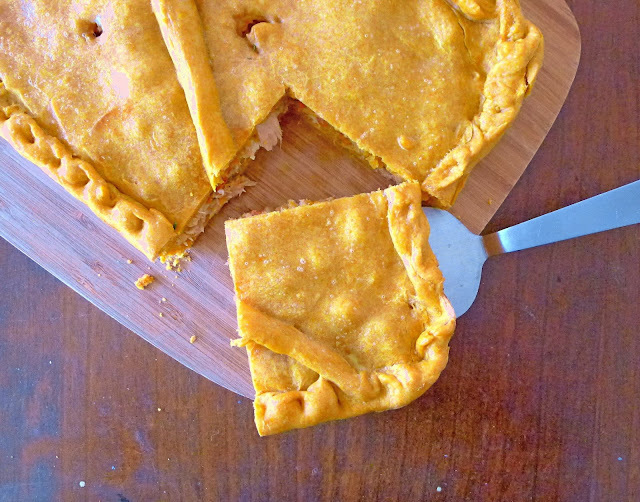 Empanada crust with olive oil is moist. 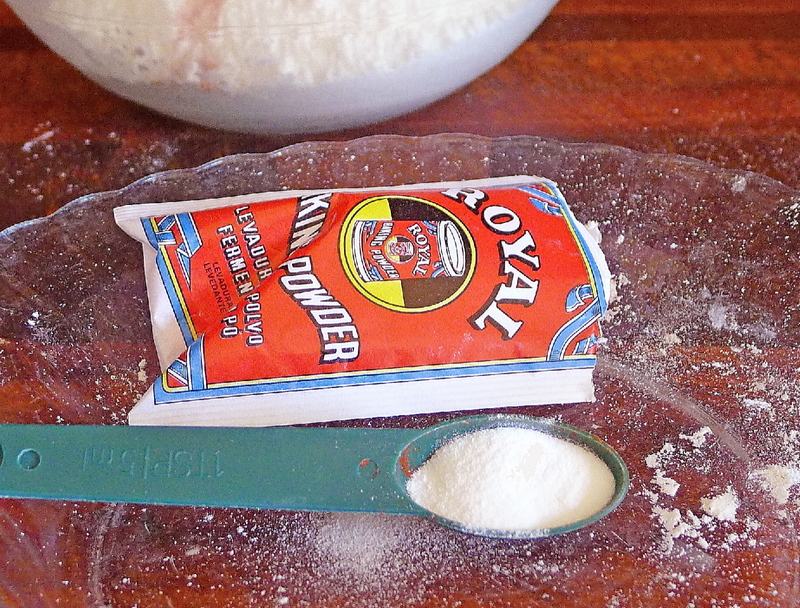 Royal baking powder, an ingredient. 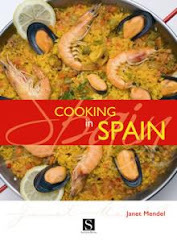 For the dough, combine the flour, pimentón, baking powder and salt in a bowl. Combine the oil and water in a cup. Make a well in the center of the dry ingredients and pour in the oil and water. 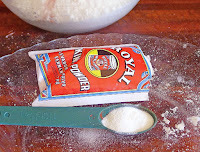 Use a fork to mix the flour and liquid until they form a ball. Turn out on a lightly floured board and knead to make a soft dough. 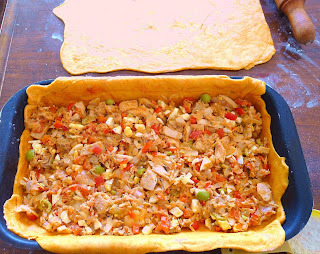 Cover the dough and set aside while making the filling. 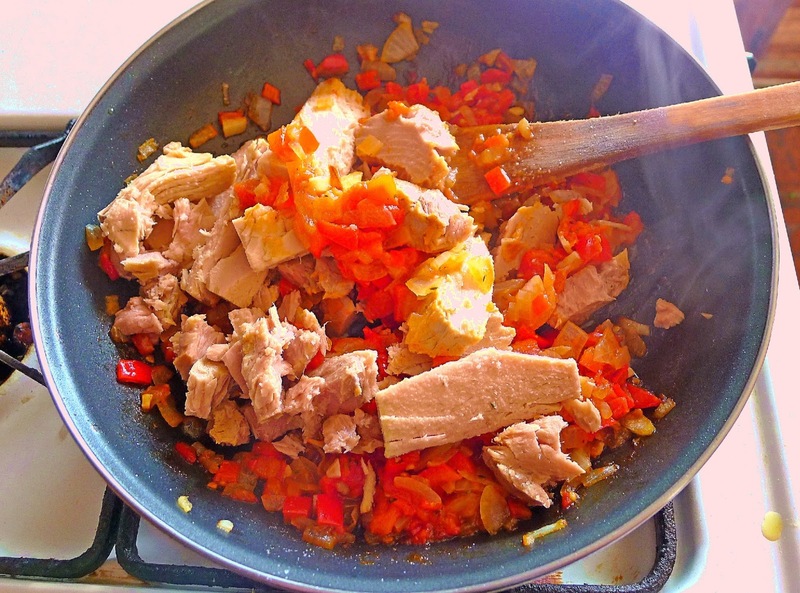 Tomato sofrito with tuna for the filling. Heat the oil in a skillet and sauté the onions, peppers and garlic until softened, 5 minutes. Add the tomatoes, salt, pepper and thyme, if using. Cook this sofrito 5 minutes until tomatoes are slightly reduced. Add the drained tuna, broken into chunks, the chopped eggs, sliced olives and vinegar. Cook a few minutes longer and remove from the heat. Preheat oven to 375ºF. Lightly oil an oven pan, 13X8 inches. Cut the ball of dough in half. On a lightly floured board, roll out one half to a rectangle about 1/8 inch thick. Roll the dough onto the rolling pin and unroll it into the oven pan. Spread the filling on top of the dough. Roll out the second half of the dough and fit it on top of the filling. Trim the edges and roll and pinch them together to seal. 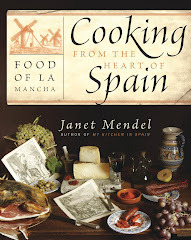 (Use any scraps of dough to roll cords to adorn the top of the empanada.) Cut slits in the dough for steam to escape. Brush the top of the empanada with beaten egg. Bake until crust is lightly golden and springy, 35 to 40 minutes. 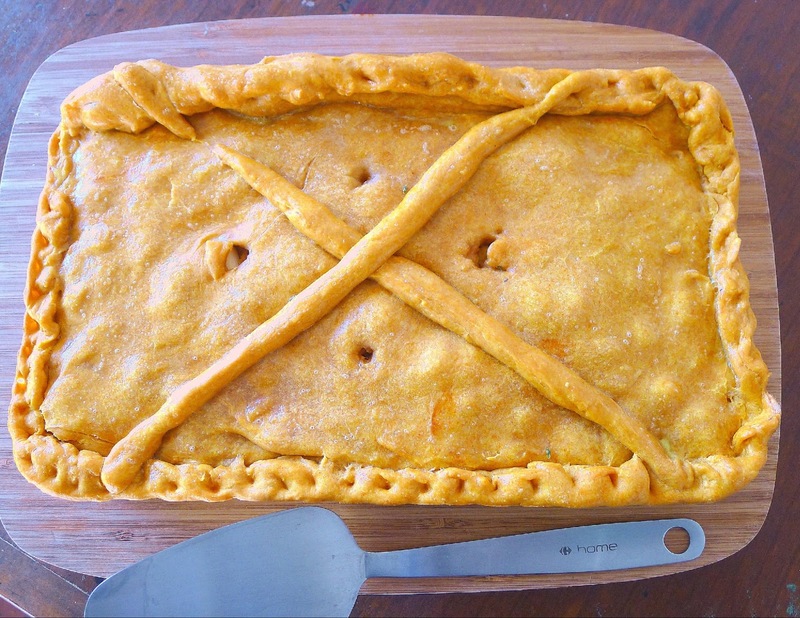 Allow the empanada to cool at least 15 minutes before slicing. 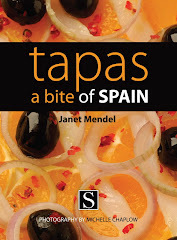 If desired, the empanada can be turned out onto a cutting board or serving platter. Serve it hot, room temperature or cold. 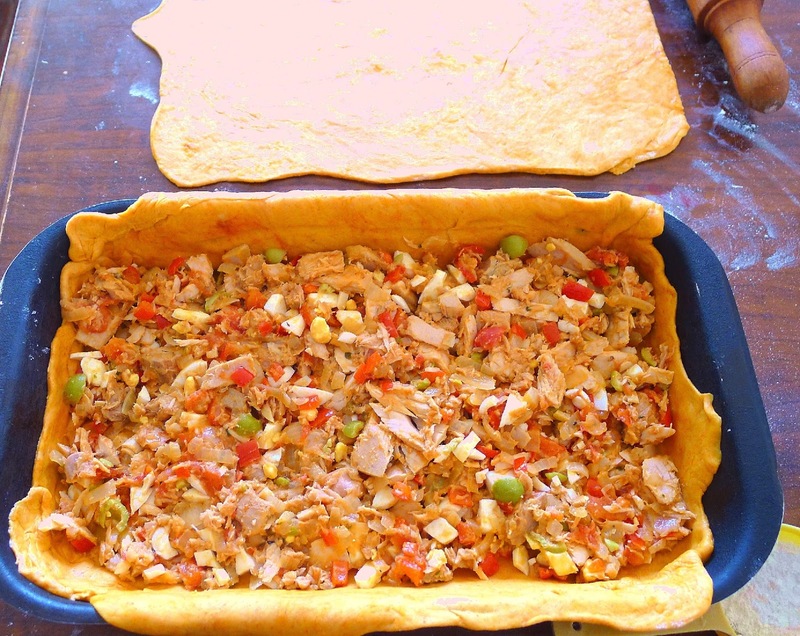 Inside the crust, tuna with a tomato sofrito, chopped eggs and sliced olives.